Note: In all honesty, this is “what I was reading during my trip to Europe back in May”, but my trip to Europe was also my “trip without wifi” and my “trip that pushed my deadlines tighter/makes writing blog posts secondary to writing novel words”, so you’re getting this review now. But you should still read this book. It’s that good. What if the only way to save the world was to rock, sparkle, and shine? What if humanity’s fate depended on how a handful of bizzaro aliens judged our entrants in a glamrock megashow battle of the bands…in space? If you’re thinking that sounds an awful lot like Hedwig meets Hitchiker’s Guide meets Ziggy, well, friends, you would be gloriously, freakishly, wonderfully right. 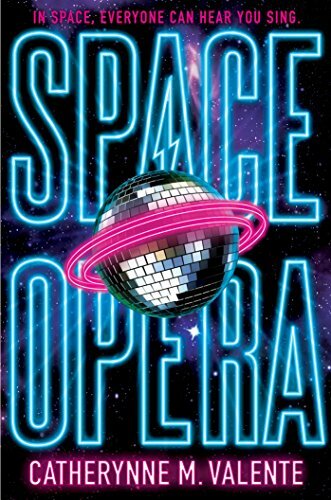 Space Opera has a deceptively simple plot: a washed-up glamrock trio–now a duo, because the lynchpin member is dead–have to perform in a Eurovision-type battle of the bands to prove humanity deserves to continue as a species. That summary leaves out the most important things about the book, though. There are aliens: time-traveling red pandas; sentient computer code (which helpfully purchases a physical form: Clippy, from MS Word); the glass-boned Roadrunner; the chainsaw murder-hippos. There is the prose: intense, delerious, inspiring and hilarious prose that sounds like beat poetry laced with profanity and cocaine. There’s the fabulously diverse cast of characters (shoutout to Nani, Decibel’s grandma, who wins all the grandma awards, #naniforever). And, finally, at last, there is the duo, Decibel Jones and Oort St. Ultraviolet, and their broken hearts. These two middle-aged, failed, and brokenhearted musicians care so much, about music and family and each other, that they are the shining, glittering soul of the novel. They know they’re screwed, they know they’re going to fail again, but in spite of that they keep trying, keep bleeding their souls out on stage. They give me courage. They give me hope that the music will outlast the dark, and the disco ball will rise again. In the end, this book just made me happy. In times like these, happiness is enough reason to love a book. If you love music, beauty, and gorgeous, imperfect weirdos, and eyeshadow, you MUST read this book. Sounds deliciously bonkers! I must read it.